The Heartless that attacked Sora's home, Destiny Islands. Sora fought valiantly to protect the islands and his memories there. The Heartless Riku attracted when he was seduced by darkness. It destroyed Destiny Islands. Zexion called Darkside in order to subdue Riku. This giant Heartless will devour all around it if left unchecked. The dark homing blasts fired from its chest can be turned back on it with a block. Target its hands or, if possible, its head. TIP: Earth-based attacks like its homing blasts can halve your current HP. 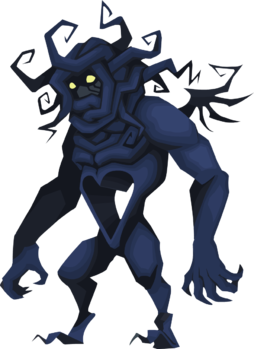 A giant, heavy-hitting Heartless that tried to put Sora's lights out. And while Sora triumphed over the Darkside, he wasn't ready for the downside: getting swept into the dark torrent that ensued. With lots of HP and the use of various status enhancements, this colossal creature is one tough cookie. Dispel and Medals with healing capabilities are the key! 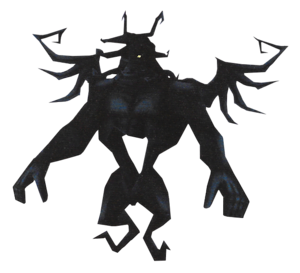 A large monster that appeared with a horde of Shadows when darkness overtook Sora's island. Copy the enemy card your opponent is using. Nothing happens if your opponent has no enemy card in play. 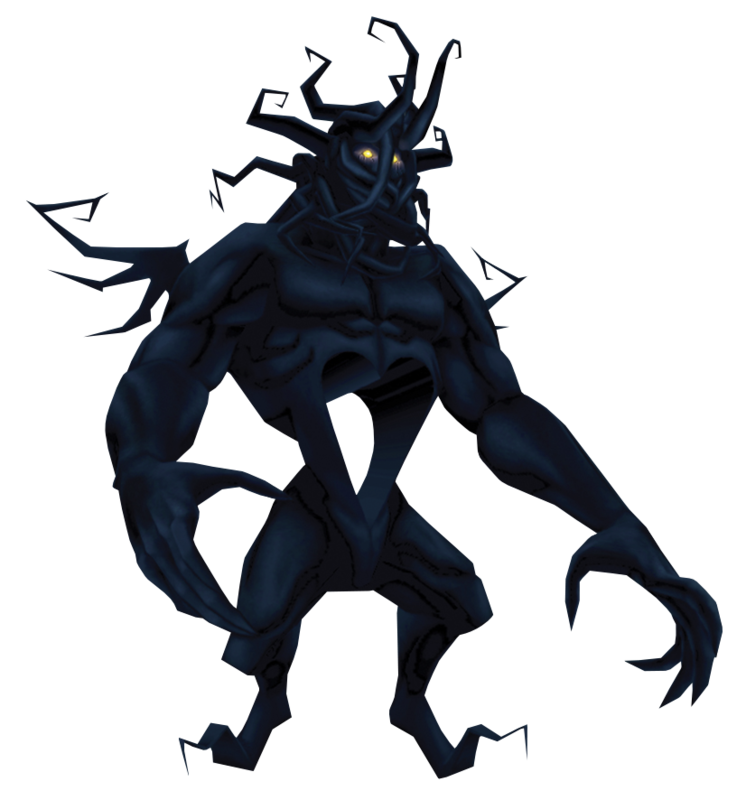 The Darkside is a Pureblood Heartless that first appeared in Kingdom Hearts. It is one of the bosses at the Dive to the Heart, Destiny Islands, End of the World, and Twilight Town. A Darkside is a massive, muscular, humanoid Heartless with black skin. Its legs are rather short and its feet are very thin and curl upward. Its arms are quite long, and it has two relatively small, twisted wings on its back. There is a large, heart-shaped hole in the Heartless's abdominal area, which penetrates straight through from the front to the back. Its head is covered in dozens of twisted, black tentacles. Only its small, glowing yellow eyes are visible. In Kingdom Hearts, Darkside had a flap of skin where the heart on its body creases at the top, whereas in Kingdom Hearts Re:Chain of Memories this flap of skin was removed for unknown reasons. The Darkside battle shares many similarities with the Twilight Thorn, a gigantic Nobody. Both appear in Roxas and Sora's Dives to the Heart, respectively, and are the first bosses of the game. Their Japanese names, Twilight Zone and Darkside, are both science-fiction horror serials. Aqua wanders the Realm of Darkness until a Darkside rises before her, with three more appearing to flank her. Aqua summons the Master's Defender, but loses hope and decides to let the darkness consume her. As one of the Darksides prepare to attack, two shimmering lights destroy them, revealing themselves to be Terra and Ventus's Earthshaker and Wayward Wind. Aqua then looks on as the Keyblades disappear from sight. Darksides under a giant red "sun". Darksides appear in the Realm of Darkness. They fight Aqua in the Enchanted Dominion, creating a giant red orb that disappears when they are defeated. As Sora progresses through his Dive to the Heart, his shadow eventually grows into a Darkside. Sora attacks the giant, but is eventually sucked into its darkness. After the Door to Darkness is opened, a Darkside attacks the Destiny Islands and battles Sora. Upon its defeat, it is sucked up into a dark cloud that looms above the islands, while Sora is transported to Traverse Town. Another Darkside battles Sora during his battle with Ansem at End of the World. Sora also glimpses a number of Darksides within the Door to Darkness before they are destroyed by King Mickey. A Darkside is fought in Twilight Town during a mission being worked by Roxas and Xion. After Roxas depletes its stamina, he finds himself strangely weakened and his Keyblade knocked from his grasp. The blade reappears in the hands of Xion, who uses it to destroy the massive Heartless in a single strike. Sora fights the Darkside in the card world Destiny Islands, reliving his memories of the fall of Destiny Islands while searching for Naminé. When Riku enters his own version of Destiny Islands, Zexion crafts an illusion of Riku and transforms it into another Darkside in an attempt to convince Riku that he belongs to the darkness. A Darkside appears in Roxas's dreams of Sora's memories. A data version of the Darkside appears within Destiny Islands' Keyhole, and is defeated by Data-Sora. Riku sees many of Sora's memories as he dives into his friend's heart, including the memory of Sora facing off against the Darkside that appeared on Destiny Islands. When Sora begins his Dive to the Heart, he unknowingly passes into the edges of The Final World, where he fights a semi-transparent Darkside. The Darkside uses its size and strength to easily overpower opponents. It can punch the ground, creating a pool of darkness and summoning Shadows to assist it in battle. It can also fire blasts of dark energy from its chest. Its seemingly powerful desperation move involves pulling a dark energy orb out of the ground while causing a shockwave and launching it into the sky, causing it to disperse to the ground as smaller energy blasts. The Darkside punches the ground, causing a dark pool and mild shockwave to form. This attack summons a small number of Shadows. The Darkside creates a dark force in the heart-shaped hole in its body, which fires dark homing missiles. The Darkside is an easy-medium boss, and can be defeated very quickly. In all three battles against the Darkside, the strategy for defeating it remains the same. Its weaknesses are its head and hands. This is simply a hack-and-slash battle, with no real strategy needed. Simply attack at every opportunity and avoid the Darkside's attacks. When the Darkside launches its dark missiles, time attacks just right to send them hurling back, heavily damaging the Darkside as well as granting Tech Points. Any deflected missiles grants 1 Tech point, while every deflected missile that hits the Darkside grants an additional 2 Tech points. If Sora gets low on health, defeat the Shadows that spawn, as they drop HP orbs. If one can climb Darkside's arm and attack its head, tech points are granted for every combo finisher landed. The Darkside scoops up an orb of darkness, which splits into many smaller orbs that rain from the sky. The strategy for the first battle can be used for the second battle. When the Darkside scoops up the orb of Darkness, do not run around. The missiles will vanish when guarded or attacked and will not make Sora recoil. The Darkside from this battle will act the same as the one from the second battle, so simply use the same strategies and the Heartless will fall. Interestingly, this particular Darkside spawns Shadows that drop munny when defeated, at a point where munny can no longer be used in the game. This memory-based incarnation of the Darkside utilizes the same tactics as its Kingdom Hearts counterpart. Card Breaks are an easy way to avoid damage. Again, one must attack the arms to deal damage, Sora having to jump in order for this to be done. If a Gimmick Card appears, a plank of driftwood will appear that Sora can hop upon and float up to the Darkside's head to deal extra damage, or when the Darkside is about to blast an orb from its body, one can use a Card Break to attack it before it escapes. Another way to attack the Darkside's head without using a Gimmick Card is to wait for it to summon Shadows, which requires its arm to be immobilized, and there will be an opportunity to attack its head. A combination of high-numbered Attack Cards as well as Cure Cards are recommended, along with Enemy Cards such as Jafar, Maleficent, Vexen and Card Soldier to make the battle easier. Sleights are not as critical in this battle, as the Darkside's dimensions make it easy to miss, wasting cards. The strategy above holds similar to Riku's battle with the Darkside. Riku can also utilize Dark Mode, Dark Firaga being the most reliable Sleight in his arsenal, considering he only has two. Dark Break can be used more commonly, but it will often miss, although it does have a tendency to hit the head. In Kingdom Hearts Re:Chain of Memories, the only difference is the Gimmick Card causes large plateaus to rise from the ground. In Kingdom Hearts 358/2 Days, Roxas, alongside Xion, is also faced with the Darkside. Xion will mainly cast Fire spells from a distance, so focus on attacking the Heartless's hands. It utilizes all techniques from past encounters and the same tactics are able to be used in order to prevent most damage. It is advised that the player Jump as much as possible to avoid the Darkside's devastating long-range shockwave attack, used after many of its tactics. Roxas should also be in constant motion to avoid the energy that rains down, using Block to deflect the energy balls back at the boss. This battle should not be too much of a difficulty. Its attacks always follow a pattern, starting with summoning the Shadows and ending with the dark balls falling from the sky. The pattern goes on until it is defeated. It should also be noted that the Darkside's head is his weak spot, so attack there whenever possible. The Heartless will strike with its hand, and three Shadows will appear. In this game, the Darkside has three forms. The first form is simple; the Darkside is out of reach from Data-Sora, who stands on a cliff. The Heartless will strike with its hand, and three Shadows will appear. After it strikes the ground, attack its hand with physical and other attacks. After depleting its HP, it will take on a new form. The Darkside strikes, releasing numerous bugged blocks upon contact with the ground, which deal damage to Sora. The Darkside leans back and releases a barrage of orange blocks at Sora, throwing him back and dealing damage. The Darkside will again strike, but this time, it will release numerous bugged blocks upon contact with the ground and they deal damage to Sora. To attack the hand, Sora must delete a layer of bugged blox which cover its hand. The Darkside will slump forward and its head will lay stunned, on the ground and open for attacks. If one is not quick enough, the hand will turn transparent and attacks will not hit. After a punch, the Darkside will lean back and release a barrage of orange blocks at Sora, throwing him back and dealing damage. Dodge it by using Dodge Roll until he is close to the Darkside. After the barrage, it will resume its cycle of punching. The Darkside hops around, each time releasing a small shock wave. The Heartless turns into a swirling mass of blocks, which proves lethal if contact is made. In its last form, the Darkside will become entirely invisible, nothing but a bunch of orange blox. In the center of the swirling mass, there is a purple blox, which represents the Darkside's health. Dodge Roll is useful for this, as the Darkside will hop around, each time releasing a small shock wave. Consequently, it will turn into a swirling mass of blocks, and prove lethal if contact is made. Dodge Roll is faster than running; it can avoid the Darkside's attacks. Soon, it will separate, and the purple block is wide open for attacks. But do not be idle for too long; it will close after some time. Destroy the block by repeating the process over and over. Darksides are recurring enemies in this game, behaving more like mini-bosses. They are mostly encountered in the Forest of Thorns, with one serving as a boss. Another Darkside appears as the first challenge in the secret boss rush. They retain their signature battle style, but their Shadow-summoning punch is accompanied by a larger shockwave, and the projectiles summoned by the orbs of darkness are spiked orbs that create pools of darkness that can damage Aqua if touched. Unlike past incarnations, Darksides cannot be climbed. However, Aqua's Doubleflight makes up for this. ↑ x0.03 in the End of the World. ↑ The Darkside takes 7 damage per hit. This page was last edited on 17 April 2019, at 17:39.